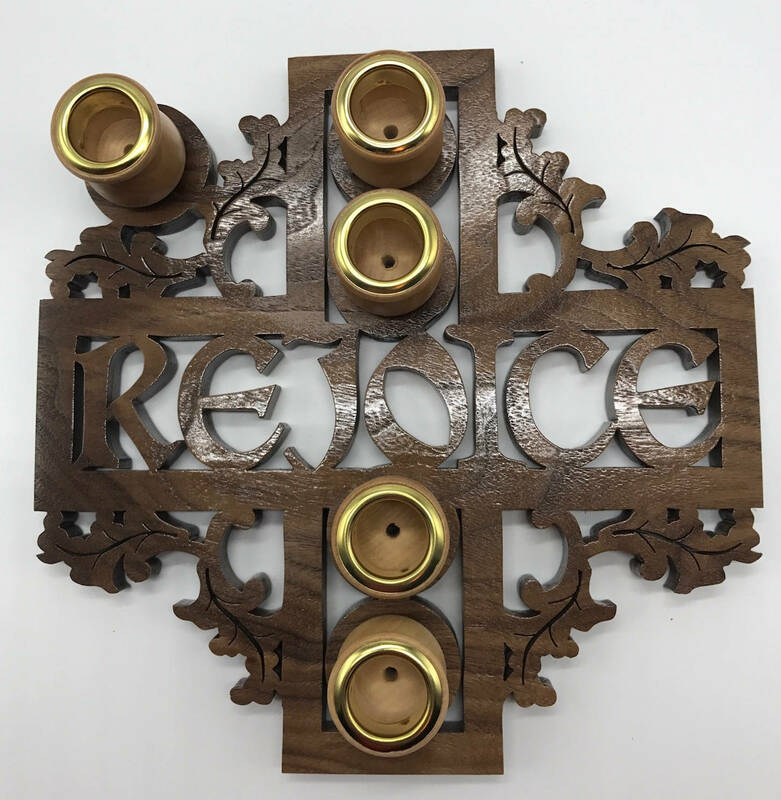 This beautiful, scroll sawed Advent wreath is made of ½” walnut with birch candle cups and brass cup rings. It is 10 inches diameter and features the word Rejoice, which comes from the historic Introit for the 3rd Sunday in Advent: “Rejoice, and again I say rejoice…”. The wreath uses standard tapers (7/8” [nominal] base). It normally ships in 3-5 business days. The Advent wreath, or Advent crown, is a Christian tradition that symbolizes the passage of the four weeks of Advent in the liturgical calendar of the Western church. The Advent Wreath is traditionally a Lutheran practice, but it has spread to many other Christian denominations. It is usually a horizontal (evergreen) wreath with four candles and often, a fifth, white candle in the center. Beginning with the First Sunday of Advent, the lighting of a candle can be accompanied by a Bible reading and prayers. An additional candle is lit during each subsequent week until, by the last Sunday before Christmas, all four candles are lit. Many Advent wreaths include a fifth, ‘Christ candle’ which is lit at Christmas Eve or Christmas Day. The custom is observed both in family settings and at public church services. In Catholic and many Lutheran churches, the most popular colors for the Advent candles are violet and rose, corresponding with the colors of the liturgical vestments for the Sundays of Advent. In the Western church, Violet is the historic liturgical color for three of the four Sundays of Advent: Violet is the traditional color of penitential seasons. Rose is the color for the Third Sunday of Advent, known as Gaudete Sunday from the Latin word meaning "to rejoice". Rose-colored vestments are used on Gaudete Sunday, as a pause to the penitential spirit of Advent. Blue is also a popular alternative color for both Advent vestments and Advent candles, especially in some Anglican and Lutheran churches. This is in keeping with the liturgical seasons; blue means hope and waiting, which aligns with the seasonal meaning of Advent. White is the traditional festal color in the Western church (used for the fifth candle). Pattern design and commentary by Sue Mey. Good quality. Lasted through advent and I will use for next year. So beautiful. Better than pictured. Well made and looks great! The work was beautiful and exactly as described. Matt was great and communicated with me to help get me the package in time for Christmas.